Everyone’s favorite time of the year is just around the corner. Treat yourself and your loved ones this Christmas with quality gift items and get more from Moto. 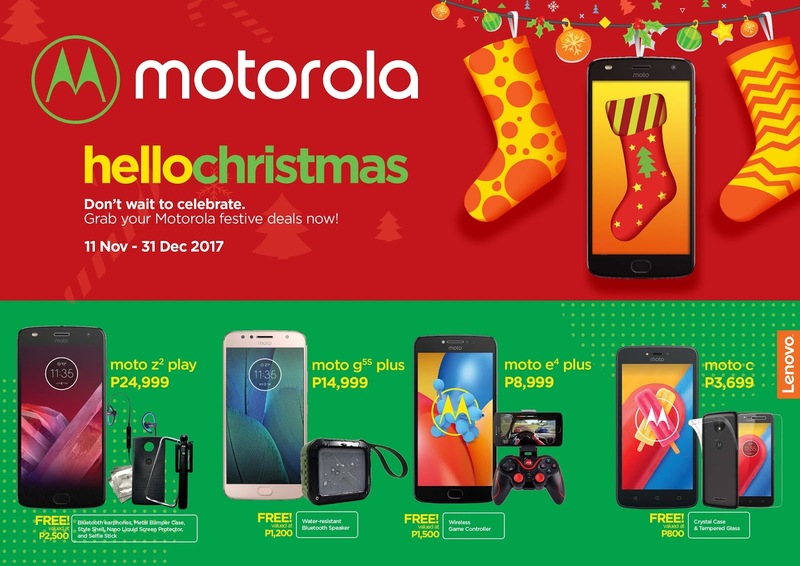 From November 11 through December 31, visit Motorola Experience Stores and authorized dealers near you to enjoy these exciting freebies. Christmas is everyone’s favorite season for parties, reunions and almost all other activities and reasons to gather together. Give the gift of tech that can outlast the day. With the Moto Z’s all-day battery, worry no more about the phone running out of juice. The unit’s TurboPower charging injects up to 8 hours of battery life in just 15 minutes. The ultra-thin phone uses aircraft-grade aluminum chassis for extra durability. The phone lists at only PHP29,999, with a FREE Incipio PowerPack mod. Besides getting 30 hours of battery on just one charge for truly unlimited possibilities, the Moto Z2 Play makes selfie moments even more fun with its camera’s dual autofocus pixels and laser autofocus technology. It comes with a FREE Moto Gift Box and Over-the-Ear Bluetooth Headphones for only PHP24,999. For even less, enjoy up to 50 hours of smartphone battery life with the Moto Z Play. Complete Christmas shopping, run other errands and meet with friends on a single battery charge. There will still be power left for some gaming. The Moto Z Play is available for only PHP 19,999, with a FREE Incipio PowerPack mod. Christmas is about sharing our blessings with our loved ones. The Moto G5s Plus is the ideal present at only PHP14,999. With its 13MP+13MP dual rear cameras and 8MP wide-angle front camera, snapping get-togethers and reunions becomes a lot easier. This Christmas, the Moto G5s Plus comes with a FREE water and dust-resistant and shock-proof Bluetooth speaker for anywhere entertainment. It’s smaller sibling, the Moto G5s, features a rapid-focus 16MP rear camera and a 5MP selfie camera. Crystal clear images of Christmas bonding moments can be stored in the phone’s 32GB memory. For just PHP10,999, the Moto G5S comes with a pair of FREE In-Ear Bluetooth Headphones. Maximize vacation time this coming holiday season. Raise the chill vibe with a power-packed gaming experience through the Moto E4 Plus. Designed to power you through multiple game levels, the Moto E4 Plus features a 5000mAh battery, a 1.3GHz quad-core processor and 3GB RAM. Store up to 32GB worth of games and enjoy nonstop action for only PHP8,999. A FREE Bluetooth Gamepad makes gaming even more fun. Why compromise style for performance when you can have both? For only PHP3,699 for the Moto C and PHP5,999 for the Moto C Plus, get both style and performance for an affordable price. The Moto C Family’s heavy-duty quad-core processor and Android Nougat OS ensure quality smartphone experience without any lags. The Moto C and Moto C Plus feature a micro-textured back cover for added grip. They offer added flexibility with two SIM slots and a microSD support for extra storage for more apps, photos and other files. The Moto C comes bundled with a FREE tempered glass screen protector and jelly case. The Moto C Plus has a FREE tempered glass screen protector, jelly case, and Bluetooth mono earphones. Visit nearby Motorola Experience Stores and authorized resellers to avail of these exclusive promos!